Five Star Equipment’s first 944K Hybrid Wheel Loader is complete! 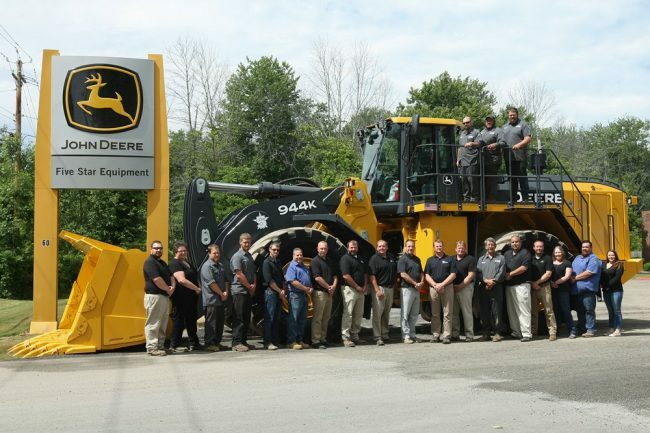 Dolomite Products purchased the loader through the Five Star Equipment Rochester branch. The 944K is John Deere’s largest wheel loader and requires special approval from John Deere with 24/7 product support before it can be sold by a dealer. The Rochester branch employees pictured on the machine include Sam Cipriano, Charlie Pragle and Mitch Morehouse. The employees standing are Brian Goldbach, Michelle Duris, John Bolton, Aaron Strait, Matt Pragle, Rob Foster, Chuck Roberts, Chris Rawleigh, Kenn Baker, Peter Bacon, Jeff Shearing, Jay Gold, Randy Schlegel, Dave Johnson, Chris Burke, Brenda Perkins, Tony Laskey and Stephanie Saylor. Missing from the photo is technician Rob Reinhart, who was in the field servicing a customer’s machine.